Store fronts are one of the easiest types of commercial real estate to invest in. This is due to the fact that many small businesses have similar needs. Large businesses can often have more specific needs. A common type of store front properties are the split units with a store front on the street level and residential apartments above. These properties are especially common in urban areas and the center of suburbs. They offer a good entry point for anyone who wants to start investing in commercial real estate since you often get a return on your investment from the residential units alone if you are unable to rent the commercial unit. Before buying a split unit you should always look at other split units in the area and if possible find out what the store fronts rent for. You should also look and see if there are a lot of empty store fronts in the area. If there are than that is a big red flag. The unit might be located in an area that business are moving out of. It can be very hard to fill commercial properties in areas that are loosing business. 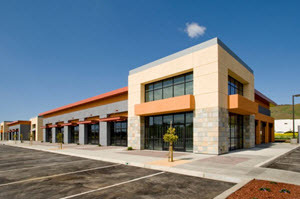 You should therefor avoid investing in commercial properties in such areas. An exception from this is rule is the rare case when business are moving out of an area that are still very popular among residential tenants. In these cases the value of the residential units will compensate for the poor commercial market. You might even be able to renovate the commercial space into additional residential units. This is however best seen as a residential investment. Not an investment in commercial real estate. Store fronts can be a profitable business and if you specialize in split units you get the benefit of being exposed to both residential and commercial tenants. This will help you minimize your risk as the economy goes though its ups and downs. You should always adjust your strategy to fit the area you are living and investing in. If you are investing in a more upscale neighborhood you should give your store a more upscale finish. If you are investing in a lower income area there is no need to waste money on high end finishes. They will not increase the amount of rent you can charge. Regardless of where you are investing you can usually increase the rent by renovating your store fronts and give them a more modern feel. You should also always make sure that your store fronts offer a business everything they need including a break room, an office, a handicap friendly customer toilet and handicap access to the store. The legal requirements for store fronts can be different in different areas. Make sure that your store fronts meet all requirements. It is especially important that they meet the local fire code. Having a store front that is not up to the fire code can cause huge economic liabilities if there is a fire and someone get injured.